Looking for something fun and not too spooky to do with your little boos and ghouls? Here's Chicago Birth & Baby's list of best Halloween Fun in Chicago and the surrounding suburbs! Head to Forest Park, IL for a frightfully good time on Saturday morning. Grab some coffee and Do-Rite Donuts from Counter Coffee and snag a spot on Beloit Ave., just south of Madison, to watch costumed teams race their homemade caskets! A fun time for the whole family! 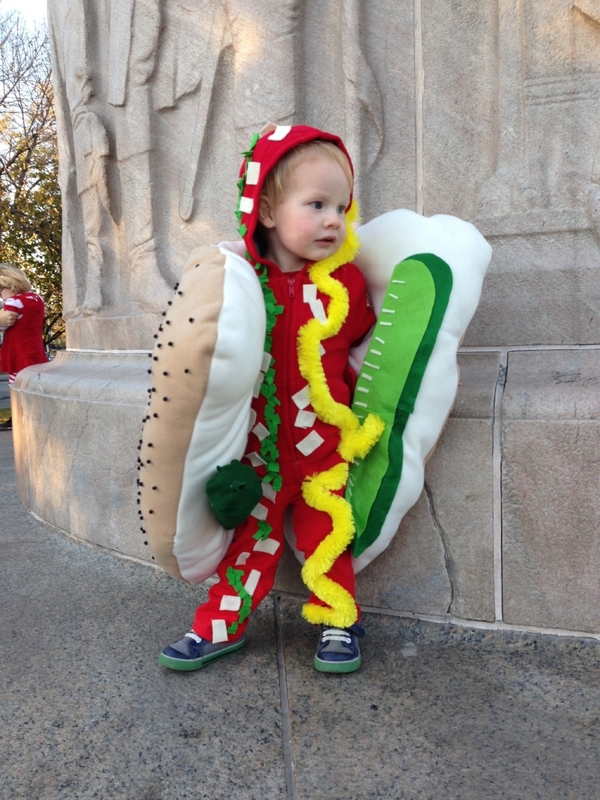 Owner Cait Sobotka's son in 2013 as a Chicago Style Hot Dog at the Parade. Chicago Birth & Baby owner, Cait Sobotka, hasn’t missed this event since her son was born in 2011 - it’s a neighborhood favorite. This year, the parade will start in Palmer Square Park at 5:00pm and will march down Kedzie at 5:30pm led by Mucca Pazza and end at another favorite spot, Lula Cafe, for cookies and cider. Come in your best costumes and bring along your musical instruments or noise-makers (is there a difference when in the hands of toddlers?) and be prepared to use them! 5pm on Sunday 10/29 beginning at Palmer Square Park, Chicago. Pumpkins, and Treats, and Rides, Oh My! Bengtson’s Pumpkin Fest in Homer Glen, IL is a festive and adorable place for families with tiny tots to school aged big kids. The farm and festival grounds are clean, well-decorated, and easy to navigate. Enjoy picking out pumpkins, snacking on fresh made apple cider donuts, a petting zoo, rides & more! It’s Lincoln Park Zoo’s 3rd annual Fall Fest. This family-friendly festival features several attractions throughout the zoo including: a fun slide, hay mountain, ferris wheel and more. There will also be music, chats about the animals in the zoo, and lots of pumpkins! Cait Sobotka is a labor & postpartum doula, placenta encapsulator, and the owner of Chicago Birth & Baby. She lives in Humboldt Park with her family.